Distant, triumphant, and majestic, this record wanders the cold realm of fog in a mood that well-captures the feeling of epic melancholy. In that way, it is most reminiscent, to me, of Mortiis' "Født til å herske," cold and detached, yet glorious nonetheless, certainly a fitting mood for ruins in the mist. It is undoubtedly escapist in its goals, going directly into another world and allowing us to follow, if we are able. 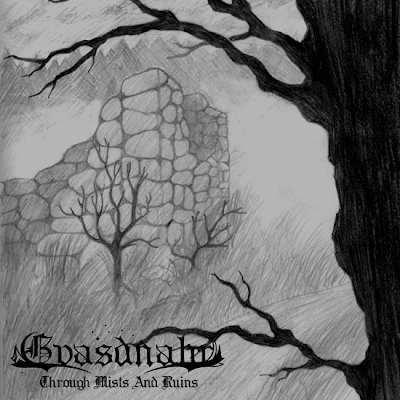 There is little warmth and accessibility in its presentation, but that simply comes with the nature of dungeon synth, sometimes more strongly than others; one must simply learn to appreciate the exploration of the music as a place rather than a story, and it is in that way you can come to understand what this genre, and especially this album, are about. I've wanted to review Gvasdnahr for quite some time, considering he is one of the currently-active musicians in the style, and so the timing of this recent album's release was quite fortunate. The artist offers it as a free download as well, so there's no harm in trying it. While this project is still fairly new to me, and for that reason I'm unconfident in asserting any overly strong opinions about it, I'd still say this is his best work so far. I'm not sure what Gvasdnahr's recording methods are, however the precision leads me to believe that it is programmed rather than performed, which serves to also add to its coldness. The synths are all appropriate and familiar-sounding, for anyone that has listened to much of this genre, rarely exploring the sound of ugly or lo-fi synths, however it still most definitely has the "dungeon synth sound." The composition is similarly solid without straying into neoclassical territory, a respectable feat for this genre. This record asserts the stoic strength of the individual, a single man alone in a vast, empty wilderness. It absolutely takes more than one listen, and maybe even a few drinks to understand. This is a record which acknowledges the pain and strife in navigating this world of emptiness, and yet it acts as a soothing medicine, invoking the old concept of wyrd to provide strength for the individual man attempting to live in this world, keeping the noble, forgotten values in his heart despite the suffering it causes. Or perhaps it is a complete fantasy… perhaps these ideas were never "forgotten" values from the past, but rather they stem from some other place, a new place of fantasy yet to be fully explored, which can provide meaning and context in this land of emptiness. I must reiterate, this album takes multiple listens to grasp. I am fully dedicated this genre and, to be honest, I was still somewhat turned off during the first few listens. As I'm writing this now, it must be my third or fourth listen, and it's entirely different than the first two, and very engaging. It's been too long for me to remember if this was the same case for Mortiis, however I know it’s the same case for Til Det Bergens Skyggene, and so that leads me to believe that many of these artists are unique in a way that makes for difficult initial comprehension. Give this album time and several listens and I really believe it will grow on you, if it hasn't grasped you from the first. Anyways, this artist deserves more attention, especially since his works are offered freely. Is there a physical copy of this available anywhere? I'm pretty sure there's not. For what it's worth, I prefer it that way, since a label would likely discourage it being offered freely to download, and since this music is not about money, I think the more people that are able to listen to it the better. Perhaps if dungeon synth gets respected enough, it could earn a position of free downloads as well as vinyl for collectors. This is just personal opinion, however, and I'd be interested in hearing your thoughts on physical music vs. freely downloadable music. Shouldn't be a problem, if ye just go DIY. Knocking up a few tapes or cdrs and covers is pretty easy. I do it all the time, and then put the material up for download as well. Bandcamp will even sell the physical copies for ye. No sweat. If you're aiming for bigger labels who are gonna put out 1000 cds or 12"s or whatever, then my advice is to forget about it. That mode of business is old hat and I don't think it really suits this sub genre in terms of size or style. PS; I think what dungeon synth really needs now is a small DIY label doing runs of 100 or so tapes and cdrs. I'd do it, if I weren't in the middle of several important projects already. PPS; oh aye, and I forgot to say, this is a cracking record. Both my favourite from Gvasdnahr and my favourite of recent (i.e. non-Mortiis) dungeon synth records. Nice work!